We love Skullcandy ‘phones here at Shiny, but did you know they also do their own line of audio speakers? 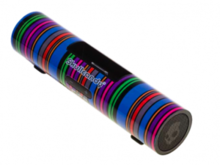 This multicoloured barrel is lovingly described as an ‘audio bazooka’, and the paint job ain’t bad either. Naturally it’s fully iPod compatible, and also charges the devices whilst they play. You get an included remote control, which is handy as the Pipe doesn’t actually have very many buttons,(only two!) minimalist chic at its best. You can run it of AC power or 4 AA batteries and the output is 5.2 watts. I’m a fan of this design, but there are four more to choose from, in more muted shades.